In 1949, flatware was on every wedding registry. Decades later, my long-divorced parents remembered more important things. 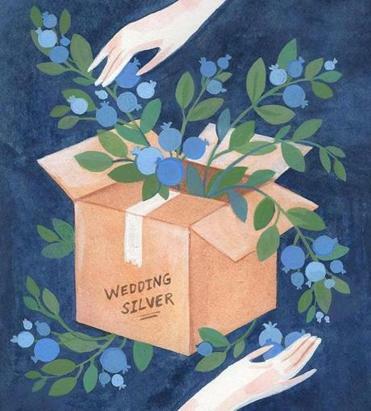 My parents’ wedding silver has lain formal and quiet in an oak box for more than 68 years, so I’m baffled that the prospect of selling it makes me feel untethered. We did not have lovely family meals at a table set with those utensils, but rather rowdy repasts with everyday flatware. In fact, my parents divorced decades ago. A year after the split, my father remarried and walked in the door of his new family home without any gifts from his first wedding. I don’t know what Emily Post would have said, but if nothing about the situation felt natural to my siblings or new stepsiblings, the fact that my parents’ wedding silver stayed with my mother did, even if we never used it. A wedding present of silver was still expected in 1949, when my parents wed, long before most things matrimonial were solved online. After the boys came home from World War II, whether a guest could afford only a single fork or spoon or a whole place setting, silver was a symbol of a secure and plentiful life. My parents’ silver continued to sit unused in a litany of houses and apartments my mother moved into and out of after we kids were grown. My mother is not a woman of domestic traditions and always cared more about her books of 18th-century verse, her political passions, and her numerous newspaper subscriptions than about tablecloths and china, but wherever she unpacked, she would place the heavy wooden box on a shelf in her bedroom closet. Neither of us gave it another thought, until a few months before what would have been my parents’ 67th wedding anniversary. The year before my father died at 94, he and my mother suddenly began talking frequently to each other on the phone. My father was on his third marriage at that point, and my mother’s latest boyfriend had died. I’m not sure either one of them remembered why they got divorced or even that they actually had. They were both aware that they had three children and four grandchildren and that when my mother initially used the toaster — also a wedding present — she forgot to take the instructions out, which caused quite a fiery start to their first wedded breakfast together. I was with my mother as they both struggled with their cellphones, bumping buttons by mistake from mute to FaceTime and back again, as they talked about a garden where they used to stand eating blueberries off the bushes until their fingers were stained blue. Although they now lived hundreds of miles apart, I heard laughter from each of them at the same time, a sound I don’t recall ever hearing when they lived in the same house. And I’ve decided what I shall do with some of my share of the money when my siblings and I sell the box of silver. There’s a community garden nearby, where I’ll donate the money to buy plants — flowers and vegetables, herbs, and even a few blueberry bushes. Perhaps in that garden one couple will laugh the way they did when they first met. Who knows? Who knows anything, but I like to think my parents would both approve. Patty Dann writes fiction and memoir. Send comments to connections@globe.com. Follow us on Twitter@BostonGlobeMag. Tell your story. E-mail your 650-word essay on a relationship to connections@globe.com. Please note: We do not respond to submissions we won’t pursue. Follow us on Twitter @BostonGlobeMag.